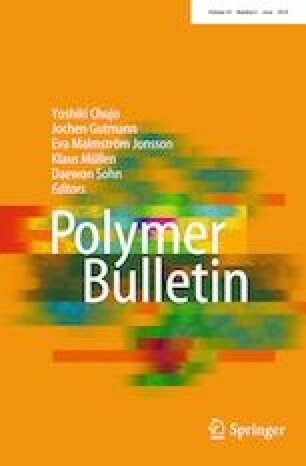 Polystyrene (PS) was electropolymerized on a stainless steel surface via a potentiostatic method, and the same was used to make its bilayers with polyacrylamide. Scanning electron microscopy and field emission scanning electron microscopy results showed that PS layers have formed two types of protrusions on the surface: nano-/microsphere-like and non-uniform microcubes at low (2 V) and high (2.8 V) voltages, respectively. Mean diameter of the polymeric protrusions increased with time. Synthesis and morphology of PS particles could be controlled by voltage changes. It was shown that Avrami equation could be used to relate the nuclei growth and time. Electropolymerization of styrene on the surface of an electrode coated with synthesized uniform nanoporous beam layer resulted in bilayer films as did the electropolymerization of acrylamide on the surface of the PS-coated electrode. This is a promising method for the preparation of reinforced hydrogels with micro-/nanoparticles for improving mechanical properties. The online version of this article ( https://doi.org/10.1007/s00289-018-2514-8) contains supplementary material, which is available to authorized users.